Echinochloa colonum (L.) Link, E. crus-galli subsp.colona (L.) Honda, Echinochloa verticillata Berth., Panicum colonum L., P. cumingianum Steud., P. zonale Guss., Milium colonum (L.) Moench, Oplismenus colonus (L.) Kunth, (USDA, 2011; Cirad, 2011). Jungle rice (Echinochloa colona (L.) Link) is an annual (rarely perennial) grass, 30-100 cm high. It is green to purple, tufted and shortly stoloniferous. Its culms are glabrous, cylindrical, erect and decumbent. They are red purple at their base and can root at the lower nodes (Catindig et al., 2011; Ecoport, 2011; FAO, 2011; Quattrocchi, 2006). The leaves are flat, 10 to 25 cm long, 3-7 mm wide, sometimes tinged with red at their base. The inflorescence is green to purple, 6-12 cm long and bears 4-8 short racemes on the main axis. The sessile awnless spikelets are arranged in 4 rows on one side of the racemes (FAO, 2011; Quattrocchi, 2006). Jungle rice is considered a noxious weed in several crops (see Environmental impact) and particularly in rice fields as it closely mimics rice in its vegetative growth stage (Catindig et al., 2011; Ecocrop, 2011). The young plants and shoots are edible and can be eaten in times of scarcity. It has also been cultivated as a cereal in Egypt and the seeds can be cooked or ground to make flour and used as a mush or porridge (Galinato et al., 1999; Quattrocchi, 2006). 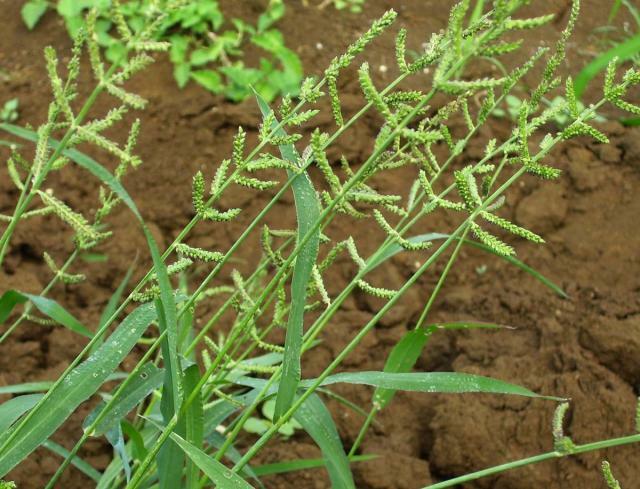 Echinochloa colona is a valuable fodder relished by all classes of livestock, notably dairy animals and water buffaloes (Catindig et al., 2011; Galinato et al., 1999; Manidool, 1992). Jungle rice originated from India but it is now widespread in the tropics and subtropics, sometimes extending beyond 30 °N and 30°S. It is naturally found in wetlands and moist soils: in ponds and swampy places, in seasonally flooded grasslands, riverbanks, edges of saline waterholes, in disturbed areas, waste places and cultivated or irrigated fields and ditches (Quattrocchi, 2006). Echinochloa colona is a fast growing summer grass but does not tolerate drought. In arid areas, it remains in moist places and dies as drought occurs (FAO, 2011). Jungle rice grows most commonly at low altitudes but can be found at up to 2000 m and in areas where annual rainfall is ranging from 400 mm to about 1200 mm (FAO, 2011; Manidool, 1992). It can grow on a wide range of soils but does better in loams, silts and clay soils that are well-drained (FAO, 2011). In this respect it does better on upland and rainfed rice fields than in irrigated fields since it has only limited tolerance to flooding (Catindig et al., 2011). Jungle rice cannot withstand frost and is killed at 9°C (Ecocrop, 2011). 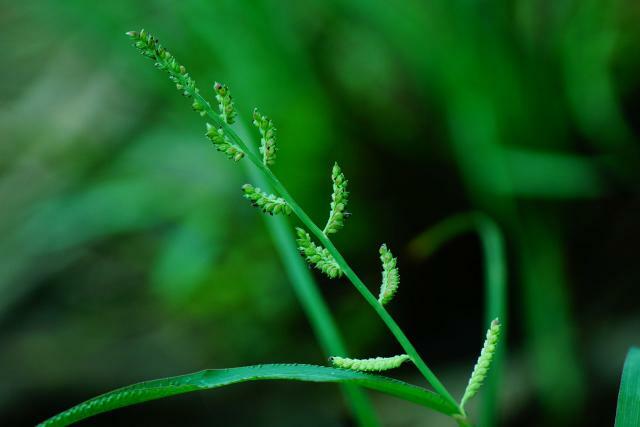 Jungle rice is a full sunlight species that cannot grow in the shade (FAO, 2011). Echinochloa colona is considered a noxious weed in rice fields. Its heavy tillering and profuse root production outcompete most rice cultivars for light and nutrients. Moreover water soluble extracts have some allelopathic effect on rice coleoptiles and radicles (Galinato et al., 1999). Mexican sunflower was reported to control jungle rice in rice fields (Abeysekara et al., 1993). It is a host of rice viral diseases such as tungro and rice yellow dwarf (Catindig et al., 2011). Jungle rice has a relatively low crude protein content (8 ± 4.2% DM with values ranging from 3 to 18% DM) and a high fibre content (crude fibre 35 ± 5.7% DM, 25-45% DM) (Feedipedia, 2011; Ahmed et al., 2004; Zaharaby et al., 2001; Bartha, 1970; Holm, 1971). Jungle rice is relished by livestock that graze it during summer. It also makes a very palatable hay (FAO, 2011). Literature about its nutritive value is scarce and includes studies with wild ruminant species. According to a gas production study, Echinochloa colona can meet the maintenance levels of ruminants (Ahmed et al., 2004). In Spain, jungle rice mixed with Echinochloa crus-galli and Digitaria sanguinalis has been made into hay and fed to sheep in pear and apple orchards (Rodriguez, 1977). In India, jungle rice did not meet the requirements of growing goats for digestible crude protein, Ca and P (Verma et al., 1995). Jungle rice is much appreciated by hippopotamuses, a very selective animal species, around the Niger River (Noirard et al., 2004). In Zambia, the digestibility of jungle rice has been measured in lechwe (Kobus eche spp. kafuensis), an antelope species. Stem were found to be more digestible than the leaves, probably due to the high silicium content of the latter. Jungle rice could meet crude protein, K, Mg and Fe requirements of adult animals but could not meet P and Zn requirements (Rees, 1978). A meal made of rice field weeds, including Echinochloa colona, was fed to broilers as a supplement (5%) to a commercial feed meal and resulted in growth performance similar to that obtained with the control diet (Anigbogu, 1999).